Octillery in game: 462 Who? Important notice! 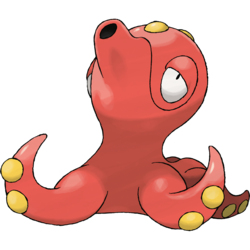 Pokemon Octillery is a fictional character of humans. Octillery is a relaxed Pokémon who loves fuss from its Trainer. In the wild, it will spurt ink at predators to protect its young from danger. Even though it is more docile when domesticated, it can be very stubborn at times in the wild. 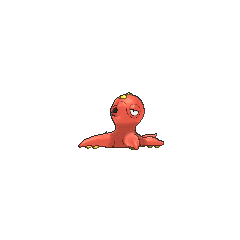 It instinctively sneaks into rocky holes, and if it gets sleepy, it steals the nest of a fellow Octillery. It sometimes sprays ink on prey by sticking out only its mouth, and its suction cups hold prey tightly. Octillery is normally found in oceans. 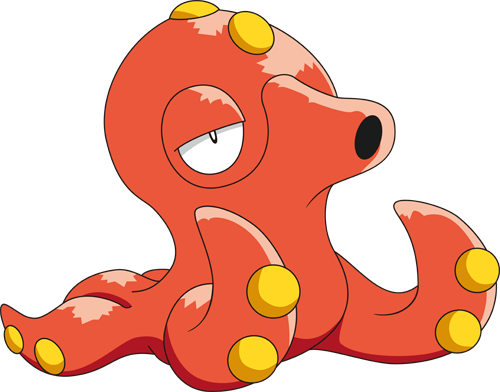 In Octillery The Outcast, Marcellus in the Whirl Islands tried to get one of his Remoraid to evolve into an Octillery and succeeded. Harley owns an Octillery, which first appeared in Harley Rides Again. An Octillery appeared in The Pirates of Decolore!. An Octillery appeared in Gary's explanation in Johto Photo Finish. EP215 Octillery Ash's Pokédex Octillery, the Jet Pokémon. Will instinctively sneak into rocky holes. It locks onto opponents with its leg suckers, then rams them with its rock-hard head. Octillery first appeared in Teddiursa's Picnic in a Pokéball of Wilton that was stuck inside the mouth of a wild Granbull. An Octillery appeared in Indubitably Ditto under Ken's control. In Miltank Melee, It is used in an attempt to capture Suicune, it fell asleep temporarily by Parasee's Spore in Iduibitably Ditto, but later woke up. 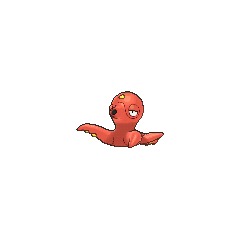 An Octillery was one of the Pokémon sent to help the fight in Ilex Forest in The Last Battle XIII. Saturn of Team Galactic used an Octillery to fend off Pearl during a mission at Lake Verity. 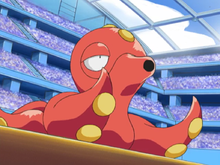 Octillery is the only Pokémon to have an attack specifically named after it; in Japanese, "Octazooka" is known as "Okutank Cannon," named after its Japanese name.